‘It was very hard to deal with growing up due to the reactions that I got at school and in public,’ Rory told Metro.co.uk. ‘People stared and laughed at me, people talked about me within earshot, people called me names such as “sausage face” and made cruel comments directly to my face. ‘I was often left out of a lot of things because other children didn’t want me to get involved because I looked “different”. It was all very hard to deal with and it held me back and affected my mental health severely. ‘People also told me, and implied, that I wouldn’t and couldn’t do certain things because of how I looked and it really affected my self-confidence. 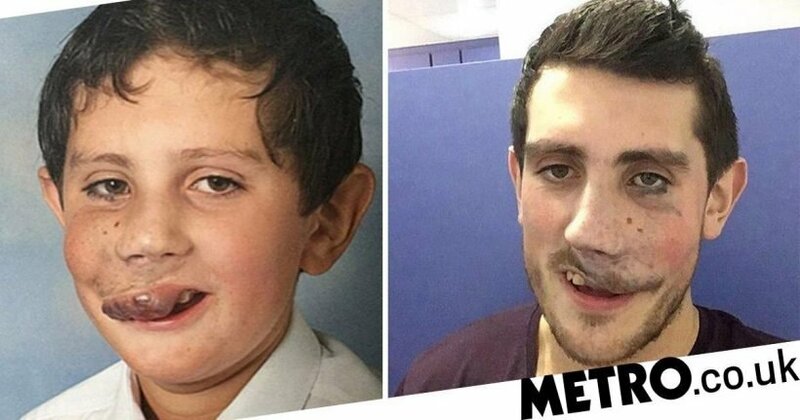 When he was 17, the birthmark was deemed too big to safely surgically remove and so from the ages of 17-22 Rory had around 15 or 16 sclerotherapy operations to reduce the size of it. Sclerotherapy involves the injection of a solution which is toxic to the extra veins and helps to kill them off therefore reducing the swollen appearance of the affected area. After about 15 or 16 sclerotherapy procedures he was told that the birthmark had reduced to a level where they could attempt to de-bulk it. His final operation was at the age of 22 where doctors managed to remove the majority of the mark. Rory says posting on Facebook about his experiences felt really cathartic to him. ‘All of that gave me a lot of confidence and it felt like a weight had been lifted from my shoulders – it really motivated me to continue to tell my story and try to help as many people as I can,’ he explained. ‘To those like me I say try not to let anyone get you down, as hard as it can be. ‘People can say some very nasty and hurtful things to you when you look a bit “different” to what is considered as “normal” but please never believe that those things are true and try your hardest not to let them affect you. ‘I struggled whenever I heard a nasty comment about me when I was younger, but over time I realised that the things that people said about me are not true and that I’m not “different” for simply being born with something rare and unique. Changing faces aim to make it easy to report a hate crime – and it can include discrimination based on birthmarks, scars, craniofacial or congenital conditions (meaning a condition you are born with), paralysis, skin conditions, hair loss, and cancer or other diseases.